When you sign up for our leads program, the signed broker hereby agrees to the following terms & conditions. Signed broker agrees that they have the authority to act on behalf of the business name provided above. If the signed broker does not have authority to act on behalf of the business name provided above he/she shall be personally responsible for all balances owed. 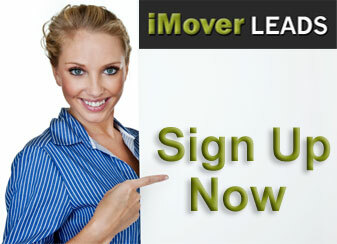 Broker agrees to pay iMover Leads a fee for leads per month. Broker will be billed on or before the 27th of every month for leads to be active for the following month. Payment is due on the 1st of each month. Payment must be received by no later than 5pm (PST) on the 1st of each month in order for Leads to remain active. If payment is not received by the 1st of the month the leads WILL BE TURNED OFF, and client is responsible for paying for lead charges incurred. Once payment is received leads will be turned back on. If payment is not received, by the 3rd, iMover Leads will automatically draft payment from checking account or credit card provided. Client may pay monthly invoice by completing the attached automated payment authorization form. The term of this agreement shall be month to month and shall automatically renew on the same terms and conditions consecutively, unless broker delivers written notice to cancel within 7 days prior to term expiration. Due to seasonal fluctuations and circumstances beyond our control iMover Leads reserves the right to reduce or cancel lead subscription at anytime. Lead package volume is subject to availability. We guarantee our cost per lead is no more than $1.25 per lead. If iMover Leads can not generate the guaranteed number of leads in any given month we will refund/credit you the difference. All invoiced amounts will be pro-rated from the day of the month your leads are actually turned on through the end of the month. Use Policy: All leads delivered are for the broker use only. The broker can send as many responses via phone, email, fax or regular mail, but can only respond to a lead from ONE (1) COMPANY NAME. The company name used by the broker to respond to the leads must be an exact match to the company name listed on this contract. Any broker found to be responding, re-selling, or sharing any iMover Leads by more than one company name will be IMMEDIATELY terminated and money WILL NOT be refunded. In addition a penalty of $2500 will be assessed for breach of contract. In turn iMover Leads guarantee’s that we will send each lead to no more than 10 brokers. This contract shall be governed by the laws of the State of California and in the event that either party enters into a lawsuit it shall be subject to the jurisdiction of Shasta County, California. Payment Terms & Conditions: As the bank account holder, you authorize iMover Leads to debit your checking account for future purchases verbally (or written) approved by account holder. Account holder also agrees that all information provided is accurate and complete. By e-signing the authorization form below client authorizes iMover Leads to create debit on client’s checking account by doing an electronic ACH transfer. By providing iMover Leads with your checking account as stated above, which includes your checking routing and account number, you are authorizing iMover Leads to debit your account by means of electronically debiting account via ACH or debiting/drafting account by creating a substitute remotely created check draft with no signature required. On the occurrence that clients check or ACH is returned for insufficient funds, iMover Leads will charge a $25 returned item fee, and attempt to re-process debit including the $25 fee, however this delay may cause interruption in lead services from iMover Leads. By e-signing this form client agrees to pay for invoiced amounts on a monthly basis until either party terminates this agreement by delivery of verbal or written notice to cancel (7 day cancelation notice). In the event that services are active and have not been cancelled, and payment has not been received, iMover Leads will automatically debit payment from checking account for any invoiced amounts owed. The term of this agreement shall be month to month and shall automatically renew on the same terms and conditions consecutively, unless either party delivers written notice to cancel within 7 days prior to term expiration. Choice of Law: If any legal action is necessary to enforce the terms & conditions of this agreement, the prevailing party shall be entitled to recovery of reasonable attorney fee’s in addition to any other relief to which he or it may be entitled. This contract shall be deemed to be made under, and shall be governed by, the laws of the State of California in all respects, including matters of construction, validity, performance, and enforcement, and it’s terms and provisions may not be waived, altered, modified, or amended except in writing and that venue of any dispute arising hereunder will be in Shasta County, California. This instrument contains the entire agreement of the parties relating to the rights granted and obligations assumed in this instrument. Any oral representations or modifications concerning this instrument shall be of nor force or effect unless contained in a subsequent written modification signed by the party to be charged.